The bad news is that there is a 429 million-metric ton elephant in the room—the amount of greenhouse gases (GHGs) produced in California in 2016. (The 2017 total is still being calculated.) The good news is that elephant is getting smaller, shrinking a little each year since 2007. Even better news: the 2016 total is below the state’s 2020 target of 431 million metric tons (tonnes) and four years ahead of schedule to boot. This encouraging update comes courtesy the California Air Resources Board’s recent report on GHG emissions for 2000-2016 (see the full report). 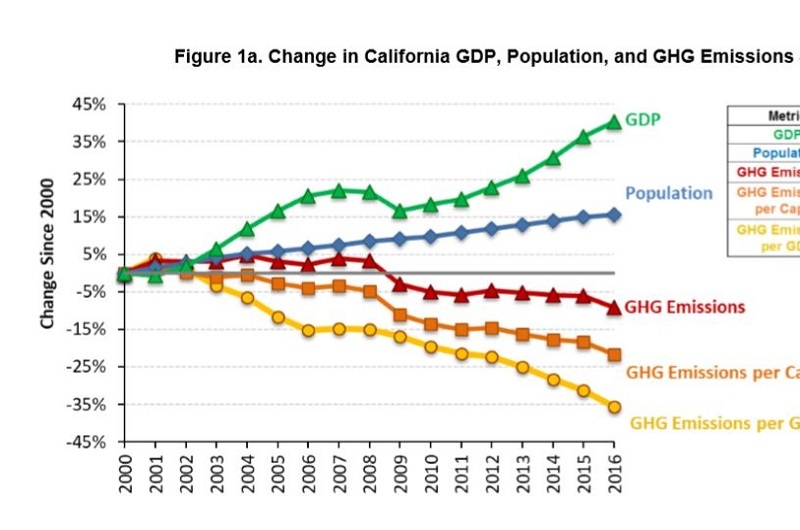 The report also revealed that the carbon intensity of California’s economy has declined precipitously by 38% since peaking in 2001 (the amount of carbon pollution per million dollars of gross domestic product). The state’s gross domestic product grew 41% during the same period, dispelling the myth that reducing carbon emissions inevitably harms the economy. 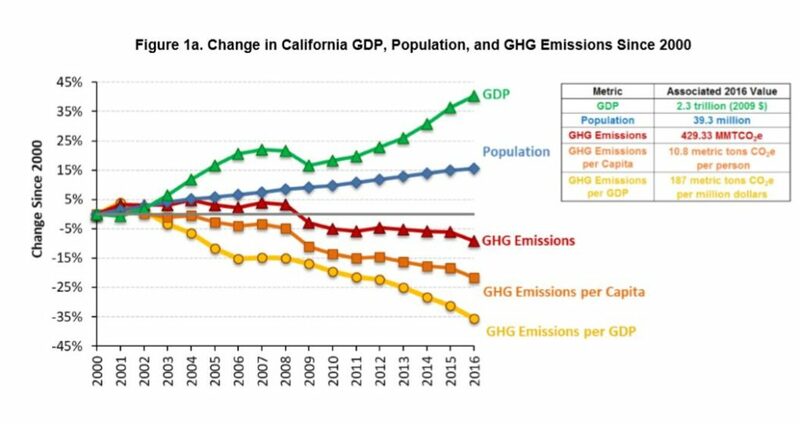 In the near term, California’s 2016 GHG total was 6% less than in 2015, even though the economy grew by 3%. 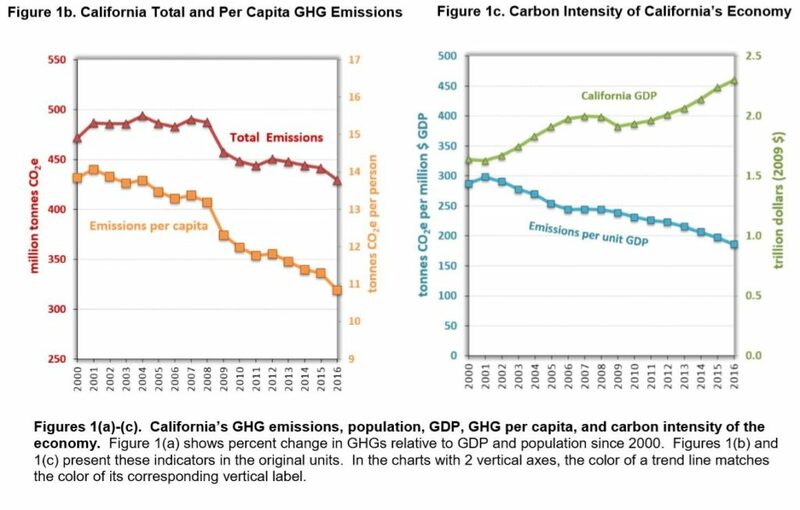 California Air Resources Board’s recent report on GHG emissions for 2000-2016 shows California has already dipped below its 2020 goal of 431 million metric tones of CO2. According to the report, each person in California produces 10.8 tonnes of GHGs annually. While that’s down from 14 tonnes in 2001, 10.8 tonnes is still a huge quantity. Everything we consume, every mile we drive, and every kilowatt of electricity we use contributes to our personal total. Despite this good news, we still need to do better individually and collectively. While no one can be expected to stop all activities that produce GHGs, we can be aware of our behavior and try to reasonably reduce our impact. The remainder of this article provides a sector-by-sector discussion of GHG production, including suggestions about how you can help keep emissions on the decline. Transportation produces 40% of California’s GHGs, by far the largest portion. Of that total, a whopping 70% is produced by passenger vehicles. Because these vehicles alone make up about 28% of California’s GHG total, the steady drip, drip, drip of passenger car miles adds up to a tsunami of GHGs. Ironically, the problem has been compounded by efforts to reduce air pollutants. The catalytic converter on all modern cars, which reduce pollutants such as nitrous oxide, unfortunately increase the amount of carbon dioxide that would otherwise be produced. Transportation did not follow the state’s overall downward trend of GHG emissions. Instead, emissions from this sector increased by 4% from 2014 to 2016, largely because of an improving economy and relatively cheap gas. Fortunately, this is an area where you, I, and every other Davisite can easily make a positive contribution. In bike- and pedestrian-friendly Davis, many local car trips can be replaced by walking, riding a bike or even a skateboard. Ebikes in particular are a practical way to get around town with minimal effort. (Check out this Cool Davis article: Is there an ebike in your future?) For longer trips and commutes, public transportation and carpools can reduce emissions. The Amtrak Capitol Corridor train and Yolo Bus provide regular service to Sacramento, and are cheaper than driving and paying for parking. There are plenty of empty seats. Though forms of public transportation (especially trains) are better for the environment than private cars, commercial airplanes are not. While the convenience and speed of being crammed into a metal tube with several hundred other people is undeniable, the GHGs produced is about the same as if every passenger drove his or her own car. Emissions from the electric power sector comprise 16% of California’s 2016 statewide GHG emissions. The emissions from this sector declined by 18% in 2016 compared to 2015, primarily from an increase in alternative energy sources of electricity. The local fix here is obvious. Switch to LED lights and energy-efficient appliances when feasible. Even then, turn off lights and electric appliances when not in use. Open your home at night to cool it off and shut it up during the day to reduce air conditioner use. Install a whole house fan if feasible. California’s industrial sector produced 21% of the state’s GHGs in 2016. This sector includes combustion from refineries, oil and gas extraction, factories, cement plants, and other stationary sources. Refineries and hydrogen production represent the largest individual industrial source, contributing 33% of the sector’s total. Emissions from this sector show a slight decrease over the past two years. An important point for individual consumers is recognizing that burning gasoline or natural gas not only produces GHGs at the time of combustion but also in the production process. Using less fossil fuel reduces emissions at both points. The same is true for using concrete. Pouring a patio may seem benign, but concrete production contributes significantly to GHG emissions. It makes sense to explore alternatives. GHG emissions from commercial and residential uses come from burning natural gas and other fuels for space heating, cooking, and hot water heating. These represent 12% of overall GHG emissions, with 7% coming from residential uses. Emissions from this sector have increased slightly since 2015, but emissions per square foot seem to be trending down since 2000. Agriculture contributed 8% of California’s total GHG emissions in 2016. The largest portion by far (75%) was from meat and dairy production. This comes primarily from “enteric fermentation” (resulting in gas emanating from both ends of a cow) and manure management. Even though California is the fruit-and-vegetable capital of the country, crop production is responsible for only 25% of total agriculture GHG emissions. High global warming potential gases account for only 4.6% of the GHGs in California. But they demonstrate the complexity of environmental interactions since they were introduced to decrease the ozone depletion caused by gases such as freon. Approximately 80% of the high global warming potential gases are refrigerants. No easy fix is available here. But by using your air conditioner less, you simultaneously reduce wear and tear, lower your electric bill, and may reduce emissions of high global warming potential gases. Also, buying pump rather than aerosol cans can make a difference. The report from the California Air Resources Board shows that we are moving the needle on GHG emissions in the right direction. Progress has not been easy; it has required foresight, planning, and political will. As individuals, we can do much to support and further that effort. For more information about global CO2 emissions, visit the Global Carbon Atlas. To learn about global carbon budgets, visit the Global Carbon Project. To read a Cool Davis article about global emissions from 2016. Stay tuned for an update in January. To calculate your personalized carbon emissions, visit the Cool California Calculator. To find out what cities and counties in California have developed GHG reduction plans, visit the California Climate Action Portal (CAP-Map). Visit our Rebates and Incentives page for a bit of motivation and impetus.